The season has just started, and most series and championships have just got under way. Stalls are being set-out, markers laid-down, and early predictions being made. So, how’s this for an opening tally – two series, four races, two class wins, two overall wins. That’s how Pete Morris’s scoresheet reads at the moment. Pete, a Porsche man throughout his racing career, is contesting both the Britcar series and the Porsche Open Championship this season: he began in March, at Silverstone, in the opening Britcar race, where he romped to a class win, sharing the 911virgin.com Porsche 911wih owner Henry Firman. Next time out, at Oulton Park, Pete was leading when a sudden hailstorm brought proceedings to a halt half-way through the two-hour Britcar race, the 911virgin team taking overall honours this time. Not content with that, Pete, in his own, newly-acquired Cup car, is also showing the way in the Porsche Open championship, the opening two races over the Easter weekend at Snetterton yielding a class win and an overall win. Pete is Managing Director of industrial construction company PMC Midlands, and the “burly midlander” – a tag he positively relishes – started his motorsport career 11 years ago, in sprints and hillclimbs, taking six class championships in six years. 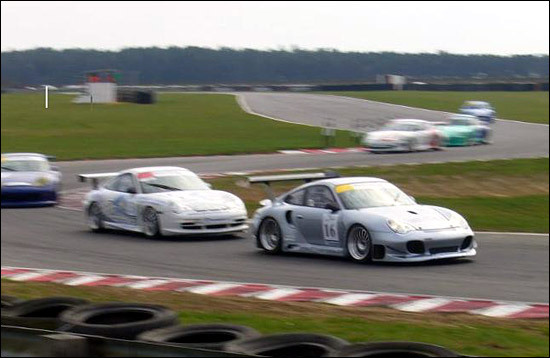 Three years of Porsche racing followed, two in the Open, where he was allegedly “never off the podium”, and a final year in the Club championship, where, driving a 968, he was class champion. 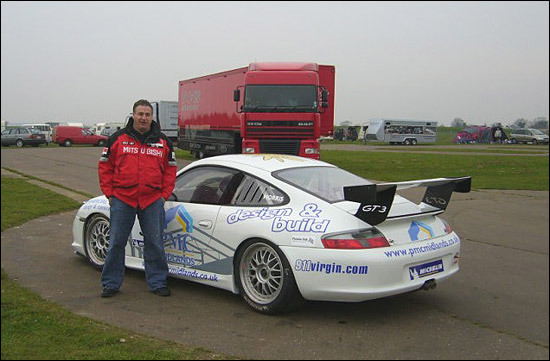 The 2005 season saw a move into the big time, but after a few early-season British GT races, in the Bill Barrett Motorsport Porsche GT3 partnering Steve Warburton, Pete defected to Britcar, joining Henry Firman’s JAZ-run 911virgin team. There, he brought stability, and a string of strong results, his bull-necked but car-sensitive style perfectly complementing Firman’s uncompromising they-shall-not-pass stance. So, after a year of driving other people’s cars, he is back in his own machine – in a very attractive livery - running a parallel campaign to the Britcar programme. The Porsche Open championship has attracted Pete for several reasons. “My company is sponsoring both the Open and Club championships this season, and every car has got a PMC Midlands sticker on the front, plus, at the support race to the Britcar Silverstone 24hours in September, they’ll be racing for the PMC Midlands Trophy,” he proudly announced. 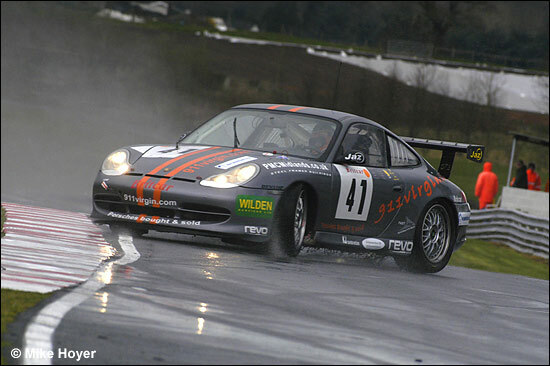 Added to this, courtesy of Porsche UK, the 2006 champion will be offered a one race drive in the 2007 Carrera Cup. So how did those first two Open races at Snetterton pan out, then ? “I couldn’t match Rupert Lewin’s GT2 RSR for speed,” he said, “he was pulling over 180 mph on the straight, and I was around 160, but I was right in his bumper in the Bombhole and around Coram. I missed a gear change in the first race – the first time ever – and did the clutch, so I had to ease off for the last five laps, and keep an eye in my mirrors.” Good enough, though, for second overall, and the Class 2 win. The ABG Motorsport team – which is running several cars in the championship – fitted a new clutch overnight, and in Easter Monday’s race, Pete took the overall victory over Gerry Harrison’s Class 1 GT3 RSR, after Lewin’s engine blew on the second lap. All in all, then, a good start to the season. But what about that brief foray into British GT a year ago – any regrets, or sense of unfinished business?